Now that the Adidas jerseys have been unveiled, with some teams getting redesigns, as well as the addition of a 31st franchise (! ), I decided it was time to update this jersey timeline from 2014. Once again, big credit to The Unofficial NHL Uniform Database for providing most of the design and color information. Part 1 – Rename All the Teams! Part 2 will be regular season rankings. Stay tuned. Today I’d like to discuss two very different hockey teams. The first team is consistently one of the least penalized teams in the NHL, drawing very few penalties per game. Let’s call this team “Team Passive“. The other team, by comparison, is one of the most heavily penalized teams in the league, averaging significantly more penalty minutes than most — “Team Aggressive“. These charts look fairly similar to the PIMs charts above, but they start to tell more of a story about individual games. Note that Team Passive has not exceeded 6 minor penalties once in the season while Team Aggressive has done so 11 times! Conversely, Team Passive played 6 games without drawing a single minor penalty; a feat that Team Aggressive could not accomplish a single time. Note that, as predicted, removing fighting majors and coincidental minors has pushed each team’s above/below league average frequency further to its respective extreme. So what’s the real story here? Perhaps one team plays a more physical style and the other relies on speed and skill? Is it possible that these teams’ different styles of play simply lead to more/fewer penalties called in the games in which they participate? Let’s compare their minor penalties per game to their opponent for that game, rather than the rest of the league. This view adds an interesting perspective. Specifically, games in which both teams and their opponents had the same number of minor penalties; a stat which, perhaps surprisingly, is almost equal between both. It’s worth noting that the discrepancy between teams is much smaller here than in the previous charts. The difference between teams in the “fewer minors than opponent” category is only 16% whereas in the comparison to league average it was 40%. This is due to the fact that to a small extent, there actually is a difference in how many penalties each team’s opponent draws on average. Team Passive‘s opponents drew an average of 3.2 minor penalties per game, while Team Aggressive‘s drew an average of 3.8. Considering an overall league average of 3.4 minors, these are fairly significant variances, particularly in Team Aggressive‘s case. By now I’m sure some of you are saying “So what? Different teams play differently”. You’re right, but that’s just it; teams Passive and Aggressive are the same team. If you haven’t figured it out yet, Team Passive–Aggressive is the Calgary Flames. As of January 19th game against the Nashville Predators, they have now played 82 games since the now-infamous “Wideman Incident” (which, ironically, happened in a game against the Predators). 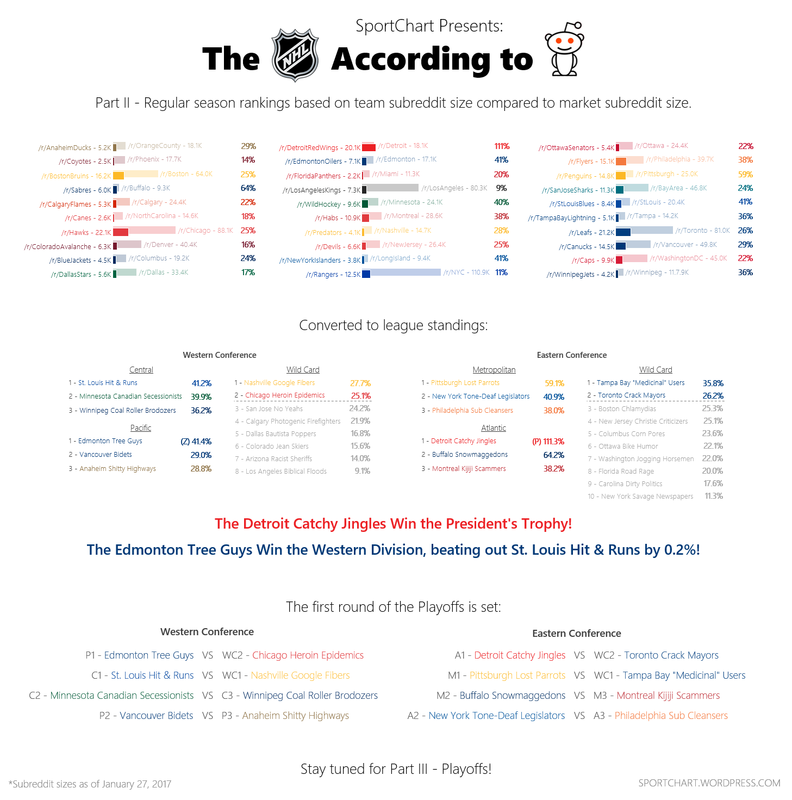 So yes, I played around with the facts a little bit when calling each team’s “season” a season. They are in fact two 82-game segments which have straddled the last 3 seasons, going back to the halfway point of the 2014/15 season. Now, I know that the point has been raised many times already, more recently even by team management. But I wanted to take a more critical look at the “Wideman Effect” as fans have coined it. How real is it, how drastic was it, and also, how can it still be a factor almost a calendar year later? 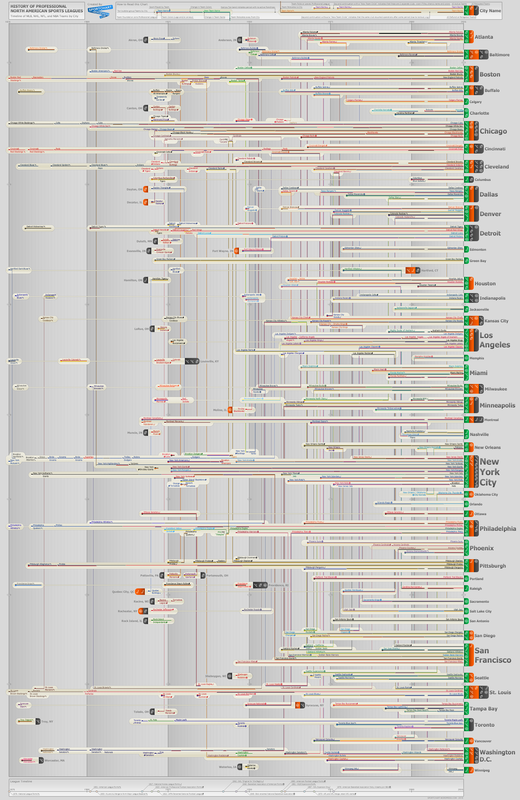 So many things jump out of this chart. You can see the steadily declining league average, indicating the less physical nature of the game, even over a 10-year span. You can see how much impact a coach and his system have on a team’s discipline (or at least, it’s propensity for taking penalties). Keenan’s Flames played a tough, physical game; Hartley’s Flames were a quick skating dump-and-chase team, and Sutter’s Flames were very… average. There is no doubt that the Wideman incident led to backlash and more stringent penalties called against the Flames in the second half of the 2015/16 season. There is no other way to explain such a dramatic change in a team’s identity halfway through a season, in particular as the Flames were all but out of the playoff race by this time and the intensity of their games would have likely waned, not increased. Look at each coach’s “identity”, Hartley’s system did not change mid season, his approach did not all of a sudden cause in influx of penalties against. This does lead to an interesting question however: what is Gulutzan’s identity? The Flames’ penalties per game have actually increased in the first half of 2016/17, under Gulutzan’s watch. Has officiating bias really followed the Flames through the off-season? Or perhaps Gulutzan’s system simply has the Flames playing a game more similar to Keenan’s, with the added calls being a byproduct of a hard-nosed system? To answer these questions, we’ll need to look at penalty calls against individual players, and hopefully find more insight. Let’s first jump back to the immediate post-incident impact. Here is the player-by-player breakdown of penalty calls before and after the Wideman hit. We are looking specifically at the 2015/16 season, and only players that played at least 20 games before and after the incident. It is pretty clear. 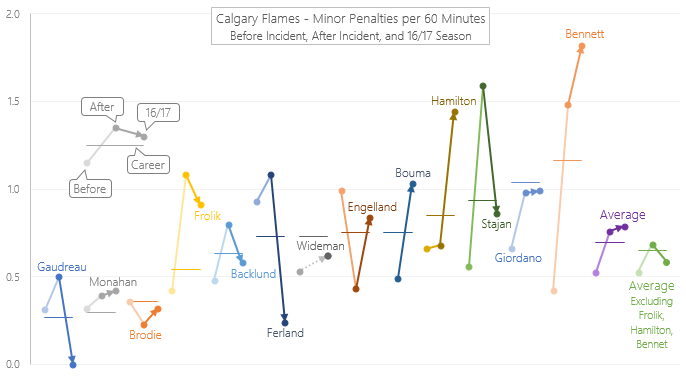 11 of the 15 players saw an increase in their minor penalties per 60 minutes (used in order to compare all players regardless of average ice time). Interestingly though, the average of all players went from significantly below career levels to just slightly above. This could indicate more of a “return to norm” rather than blind vengeance by the officials (more on this later). This chart paints a less clear picture. Some players have reverted back to their career average (both upwards and downwards), other players remain above or below theirs. The team average seems to have remained slightly above average, but I believe it is being buoyed by a small number of players. If we exclude Frolik, Hamilton, and Bennet from the average, we see an almost perfect return to the pre-incident average among the other 10 players. Is this a bit of a stretch? Possibly. But let me present one more item before drawing conclusions. “Wideman Effect” or New Identity? Let me clarify: I have no doubt that the final 34 games under Bob Hartley were officiated under a very different standard than the previous 48, or the final 34 games of any other NHL team for that matter. I am more interested in what is happening today, and whether the Flames have simply become “that kind of team” now, while the doubt cast by last season’s events has obscured that fact from most. Note that the Flames on the low end were significantly further from the average than the Flames on the high end. In fact, only the Carolina Hurricanes even come close to Calgary’s level of discipline. By comparison, the Aggressive Flames are outdone by Winnipeg and Columbus, both of whom took more penalties per game (both during the Passive Flames period). My point here is not to diminish the reality of the Wideman Effect, but to set some parameters around it. Statistically speaking, the Aggressive Flames are much more likely than the Passive Flames, all other things being equal. 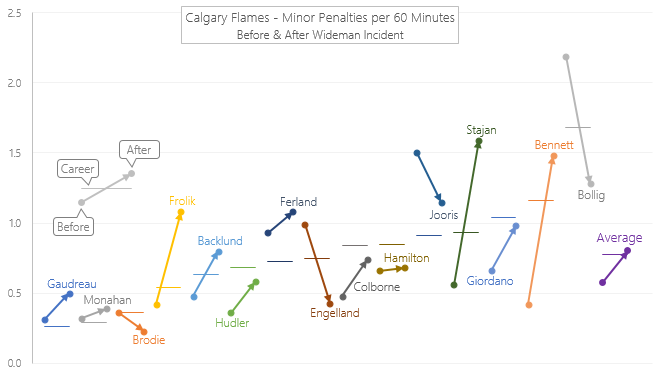 Excluding Frolik, Hamilton, Bennet, and the addition of Brouwer, Chiasson, and Tkachuk, the Calgary Flames are no more or less penalized today than they were before the Wideman Incident. There are obviously many different ways of looking at this. You can present data in various ways to prove your point. It is probably worth noting that I am indeed a Calgary Flames fan, and have tried (to the best of my ability) to take an objective view on this whole issue. After looking at the facts and figures presented above, I believe that there was absolutely an immediate impact after the Wideman hit last season. In all honestly, it would be kind of ridiculous to expect some backlash. The incident itself was unfortunate, and the NHL’s handling of the investigation, Wideman’s own behavior and attitude afterwards, and the team’s philosophy of protecting their own all led to a very tense period. Referees are human after all, and they have biases too. Looking closer at the individual players’ numbers however, I am more skeptical of any real “Wideman Effect” in the 2016/17 season. I think that Calgary is simply a much more physical team under Glen Gulutzan. They have drafted, traded, and promoted tougher players than those they let go (with Tkachuk in particular becoming a league-wide pest almost instantly). As long as Gulutzan remains behind the bench – and Burke as president of operations for that matter – I believe that this is the new reality for Calgary. 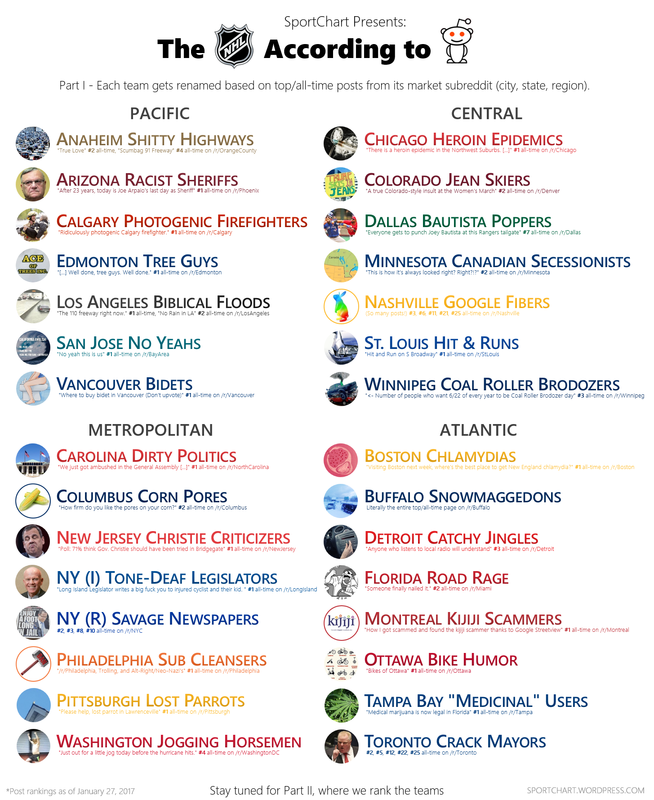 I’ve gone through the history books of the big 4 professional sports leagues in search of every team that’s ever played, every city and every franchise relocation, every name change and re-branding, and put it all in one giant chart. It’s a bit of a challenge to navigate, I admit, so take your time. I included a detailed legend at the top that I hope covers everything, but feel free to ask questions in the comments section and I’ll try to reply. Team’s formation dates are a little tricky. For the purposes of being consistent, I only looked at the date when a team officially joined its respective major league, and not necessarily when the original team was created (except, of course, for teams that were formed as part of the major league itself). For example, many of the original baseball clubs that formed the National League in 1876 had their roots in semi-professional regional leagues that stretch back to the early 1870’s. However, tracking these would have been difficult, and differentiating between various level of pro leagues would have been almost impossible and likely a subjective exercise. So, in other words, I realize that some teams are in fact older than this suggests, but I had to limit this chart to only the timelines of the 4 major leagues. Most notably, this means that I included the AFL’s formation and all of its teams are recognized, while ABA teams are only recognized once they joined the NBA. This is because the AFL merged with the NFL and all of its teams were retroactively recognized by the NFL. When the ABA folded, only a few of its teams jumped over to the NBA. Team colors are either logo or jersey colors, whichever is more prominent to the team’s identity (at least in my opinion). Note that colors going back to the 1930’s and prior are less reliable than more current years. For some team there is very little (if any) information about jersey or logo colors. For the purposes of “Cities”, there is some gray area when it comes to the large metropolitan areas in the U.S.. I have tried to the best of my ability to use only Metropolitan Statistical Areas as defined by the U.S. government. This means that “New York City” includes New York City, Newark, and East Rutherford, and that “San Francisco” includes San Francisco, Oakland, and San Jose. I believe that I have followed the generally accepted methodology here, but if any readers feel that their hometown as been unfairly included or excluded from a larger metro area I am all ears. With regards to recognition of team relocation; Teams that came back to their original city are simply listed as active teams so as to not double count the number of teams per city (for example, the Oakland Raiders in the San Francisco summary are simply shown as active, not relocated and also active). However, teams that relocated and were replaced by another team with the same name are shown as two different teams (for example, the Winnipeg Jets which became the Phoenix Coyotes, and the new Winnipeg Jets, are shown as both a relocated team and an active team). A hockey truism that I’ve heard a few times in the past is that the first home game after an extended road trip is a “trap” game, and that the longer a team is on the road the less focused they are when they finally return home. Supposedly, the players are so happy to be back home after a grueling trip that they don’t always show up for that first game back. I’ve never given much thought to this idea, but it always struck me as a bit odd. The other night I was watching the Sportsnet pre-game show and Colby Armstrong made the peculiar statement that it was “scientifically proven” that the first game back after a road trip is a difficult one for teams to win. That kind of statement piqued my interest enough to actually grab some data and see if there’s any truth to this idea. I looked at all NHL games played over the past 10 seasons. The first thing to note is that home teams win 55.0% of the time. So, yes, home ice advantage is a real thing. However, it’s only the first home game back that I was interested in. Of the 11,790 games played in the past 10 seasons, only 5,423 were games where the home team was playing its first game back from the road. And how did they do? The home teams won 2,968 of those games, or a win percentage of 54.7%. A slight drop from 55%, sure, but not enough to be a “thing”. 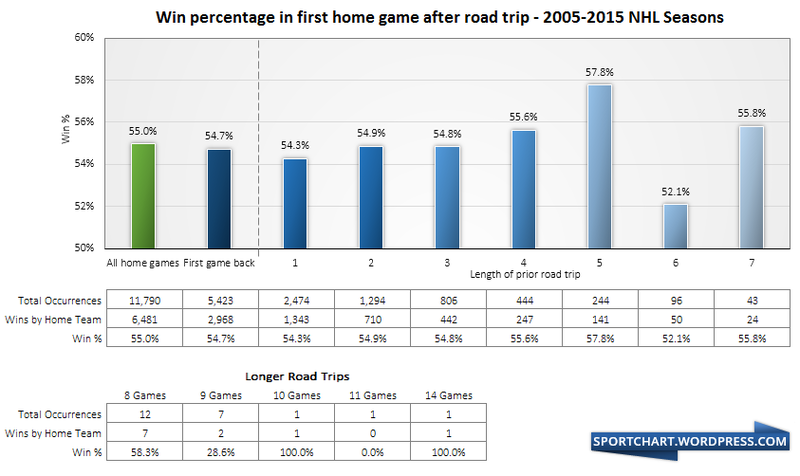 Surprisingly, teams back from 4, 5, and 7 game road trips perform better than average home success. In fact, with the exception of 6 game trips (which may simply be a sample size issue), 1 game trips seem to have the worst affect on the success of the following home game. This could possibly be attributed to quick turnaround and busy travel schedules. Overall, there seems to be little support for this idea. Home games are home games, and with a large enough sample size there seems to be very little deviation from the standard 55% home win ratio. And yes, there was one 14 game road trip… (Bonus points if you can figure out who and when). How do pro athletes stack up in terms of height and weight, and how do they compare to an average American?